Design and Analysis Ltd. is one of UK’s leading providers of specialist engineering analysis expertise to the Rail Industry. 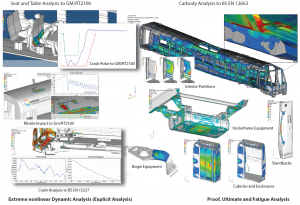 Our team of Engineers have over 60 years combined experience in rail vehicle stress analysis and a wealth of knowledge in the application of Railway Group Standards bringing significant added value to our customer’s projects. From our base offices in the East Midlands we can tackle work packages ranging from a complete carbody to small sensor brackets and anything in between. Working with OEM’s and tier two suppliers alike, we can either work independently or as an extension to our customers design and engineering teams. We can be contracted for projects as small as a few hours to projects lasting a year or more requiring dedicated resourcing. We invest heavily in the most advanced computer aided engineering tools so that our customers do not have to. Of course, because we specialise in doing this work on a daily basis, our Engineers are highly capable of wringing the most out of the software’s capabilities producing right first time results. Fatigue performance is often a design driver for rail vehicles and their attached equipment. 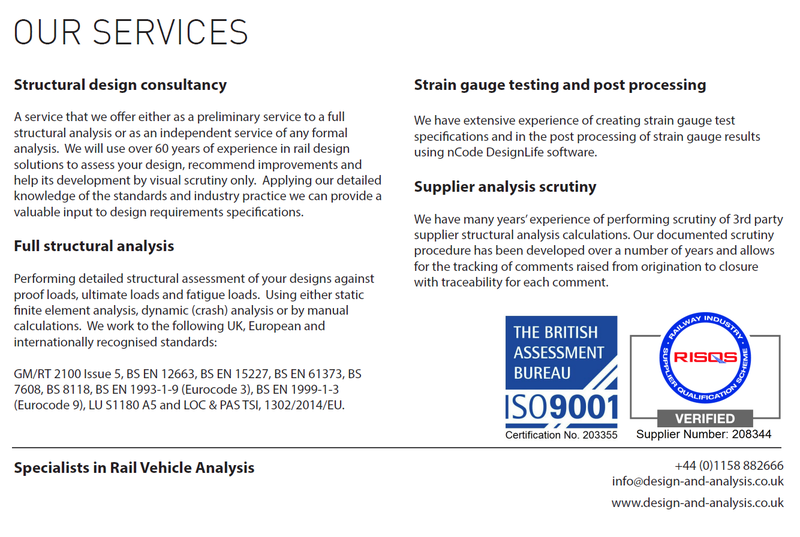 Design and Analysis has many years’ experience in the fatigue assessment of welded structures to BS and EN standards. 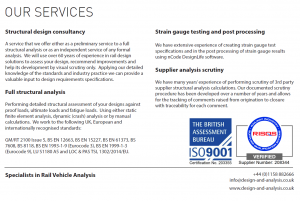 The quality of our work is of crucial importance to us and is one of the main reasons our customers keep coming back to us for their analysis needs. We have first class quality procedures controlling all our analysis work which are ISO 9001 accredited. 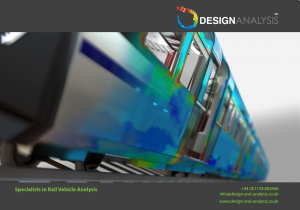 Design and Analysis has also been vetted and RISQS accredited.